Wash the green gram thoroughly and soak it in water for 20 minutes. Take chopped raw jackfruit into a bowl and add water. Wash the jackfruit. Take a microwave safe bowl and add washed raw jackfruit. Add 80ml water to the vegetable and place that bowl in a microwave oven. Cover the bowl partially and microwave on high power for 4 minutes. Stir once and again place the bowl in oven covering it partially. Cook the vegetable again on high power for 4 minutes. Allow 3 minutes standing time before removing the bowl from oven. Cool the cooked jackfruit. Now remove all the water from the cooked jackfruit by pressing. Fry the minapa vadiyalu in oil till golden in color. Cool the fried vadiyalu and break them with fingers into chunks. Grind green chilies and ginger to a coarse paste. After 20 minutes when the dal is soft, drain all the water from it. Heat a pan and add oil to it. When the oil is hot add the Bengal gram and black gram. Fry till the seeds start changing color. Then add mustard seeds and cumin seeds. Fry till the seeds splutter. Add curry leaves and ground green chili-ginger paste. Fry well. Add turmeric powder and red chili powder. Mix all well and add cooked and water separated jackfruit pieces. Add soaked and drained green gram, salt and mix well. Cover the pan and cook for 2 minutes. After 2 minutes open the lid and mix the curry. Now add the crushed minapa vadiyalu and mix. Transfer the curry to a serving bowl and serve hot with plain rice. In Andhra Pradesh we get chopped raw jackfruit in markets. For those who are residing outside A.P. get the jackfruit and remove the outer skin. Remember to oil your palms and knife before cutting the jackfruit, as it will be sticky. Then chop the jackfruit with knife to desired size. But this is a difficult task as the jackfruit will be sticky and difficult to chop. To simplify this process, cut the jackfruit into big chunks. Boil these pieces till they are tender—you can cook them in a pressure cooker. Then take the pieces and mash them or crush them in a mortar & pestle. Then proceed as above and make the curry. This curry is soft in taste (KAMMAGA UNTUNDI) unlike the curry made with mustard seasoning. The green gram gives a nutty taste. 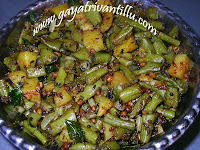 The minapa vadiyalu gives a unique touch and taste to this dish. i just like to know jackfruit curry prepn. in case its already detailed by you kindly help me to see that. My name is shanti. Recently I have seen ur web site and tried many of the receipes like ariti puvvu pappu koora, panasa pottu podi koora and other andhra recipes. They all came out well and my family (my husband, and my two daughters ) liked it and enjoyed it. Thank you for providing us such a wonderful receipes and wish that u will go on providing many more good receipes to us. I am Manoj from Guntur. I regularly cook my curries with the help of the videos given in ur site.U r helping the bachelors alot.I am very much thankful to U for doing this great favour to us. Surprisingly ,I noticed few recipes are missing in your site....Ulli pakodi and plain pakodi, aratikai bajji, mureela mixture(available at beach),chapathi, puri, Babbatlu,Chegodilu.. I am very much interested in these dishes.Mam, I will be very happy if U could provide me the procedure to cook these through ur wesite or by email. na peru Udayalakshmi. nenu me website lo vatalu choosthanu. Thanks for all your vantalu. Nenu mushroom curry gurunchi telusukovali anukutunna. mukyanga vatini wash chesay vidanam. its really a great idea in opening this web site. May be you can print a book once you feel you accomplish this task of finding uot recipes of olden times (granny days)which also have some medicinal approach too.